Dhokla is a Popular Gujarathi Savoury Sponge cake, it can be Served as Breakfast or as a snack. 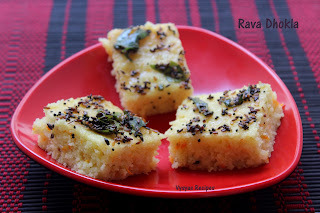 Rava Dhokla is one type of Dhokla Recipe made from Semolina or Sooji. Sooji is blended with Sour curd, with addition of eno salt to make dhokla's spongy & toppings with Sesame & cumin as 'Tadka', makes the dhokla divine. I came to know this recipe from my friend Visalakshi. In her home she often makes this as dinner. It is an easy & simple breakfast recipe, office Goers & professionals can try this at busy mornings. It can also be packed for kids lunch box Recipe. Sour Curd - 2 cups. Eno salt - 1 tsp. white Sesame seeds - 1 tsp. Take the mixing bowl add Sooji, salt & 1.5 cups of curd, to make a thick batter, and let it sit aside for minimum 2 hrs. After 2 hours, add remaining half- cup of curd, to make the batter pouring Consistency. Grind Green chillies & Ginger to a Paste and add it to batter. Grate the carrot & add it to batter. Add Sugar, lemon juice to the batter & mix well. Add Eno Salt & give a quick mix. Now immediately transfer the batter to greased plate or tray & steam cook for 18 - 20 minutes. Insert a knife or tooth pick to check if it is done. Mean while heat the oil, add mustard seeds when it splutters add cumin seeds when it sizzles add sesame seeds,curry leaves and hing. Fry for some seconds. Then add 2 tbsp of water over the tempering. Now Spread the tempering, evenly over the dhokla . Run the knife through the corners of the plate or vessel. Then cut the dhokla into desired shape & Garnish with coriander leaves over the dhokla pieces,while serving. if you don't have eno salt, you can replace it with 1/2 tsp of baking soda. i used carrot while making the batter, you could also add one handful of cooked & slightly Mashed Green peas. you can steam cook the dhokla batter directly in pressure cooker, without using pressure valve or you can add some water in a kadai,then place the plate , close the lid & cook for specified time. Always the plate, only should be half filled with dhokla batter. Looks so yummy!! Perfectly made!! Dhokla is in my to-do list. Love this rava dhokla and especially the addition of carrots. 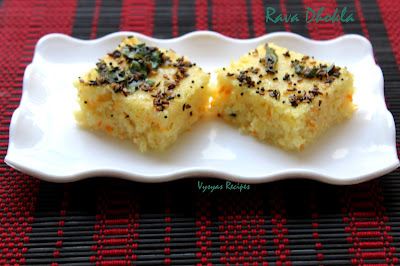 I can never get enough dhoklas, and I just love how you made it! So pretty and yummy too! This is the exact same recipe which my mom prepares. 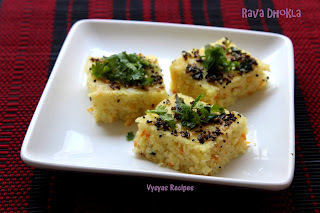 Curd is one ingredient which is available in our house 365 days and to the make the best use of sour curd this recipe is followed and i can't express my love for dhokla in words as very much addicted to any type of dhokla preparation. Excellent share..